STORRS, Conn. - UConn junior Catherine Crawley scored her sixth goal of the season early in the first period but Providence put four-straight on the board on their way to a 4-1 Hockey East win Friday night. The Huskies and Friars will close out their weekend series on Saturday in Rhode Island. The Huskies see their record fall to 7-9-1 overall and fall to 3-7-1 in Hockey East with the loss. The Friars move to 13-2 overall and are now 8-1-0 in the league. UConn fired 30 shots on goal Friday night but Providence senior Madison Myers turned away 29 to keep the Huskies in check. UConn also came up empty on two power play chances while Providence was 0-1. The Friars got two goals from senior Cassidy MacPherson and Maureen Murphy. After trailing 1-0 early on, PC put two on the board in both the second and third periods to grab control of the game. Senior Emily Landry dished out two assists while Giana Savastano, Christi Putigna and Meaghan Rickard notched one helper each. Junior Morgan Fisher stopped a season-high 43 shots in the loss. The first period featured an up-tempo 20 minutes of action that saw both teams continuously get up and down the ice. The Friar offense attempted to apply pressure early, firing off a dozen shots - goalie Morgan Fisher held her ground, turning away all 12 attempts. The Huskies applied a bit of pressure of their own but the Providence goaltender showed that she was equally up to the task as she stopped all six UConn shot attempts. UConn broke through early in the second period - After Tristyn Svetek's shot went wide, Catherine Crawley gathered the loose puck, skated along the baseboards and netted a wraparound goal to give the Huskies a 1-0 lead 3:38 into the second period. Providence found the equalizer 10 minutes later - Following a Morgan Fisher block on a Giana Savastano shot attempt, the loose puck was batted around in a scrum in front of the net until Cassidy MacPherson snuck a goal in just under the crossbar at 13:21 off a touch-pass from Savastano. The Friars took a 2-1 lead with just under four minutes left in the period behind a Maureen Murphy goal at 16:14. 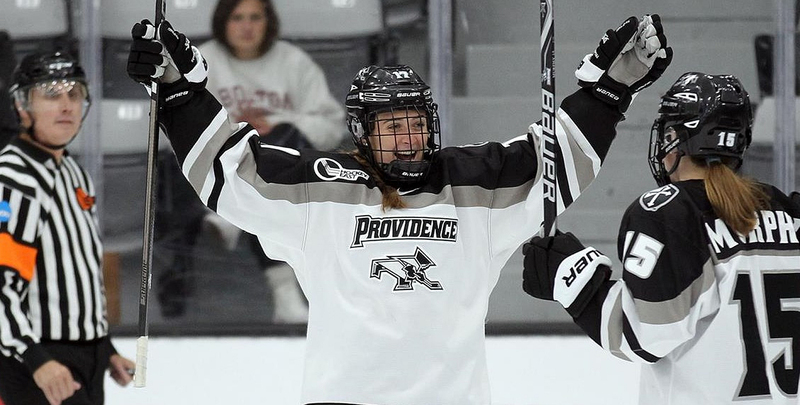 Providence extended its advantage to two goals after MacPherson gathered the puck out front and dragged it through the crease before sending a backhand shot past the glove of Fisher, giving the Friars a 3-1 lead 1:21 into the period. After calling a timeout at 16:30 down two goals, the Huskies swapped out Fisher for an extra attacker looking to make up some ground. A Providence penalty gave UConn a six-on-four advantage with about two and a half minutes to go, but a mishandle turned into an empty net goal for the Murphy, allowing the Friars to leave with a 4-1 victory.